Our family-owned business is always on the lookout for dedicated talent. If you take pride in your work and believe in delivering top-notch customer service, then you have come to the right place! For confidential consideration of a TEMA job opportunity, please submit your resume and information on the submission form below. Ability to climb ladders and work in heights in excess of 50 ft.
TEMA Roofing Services is an equal opportunity employer, and does not discriminate on the grounds of age, race, gender, religion, national origin, disability or lifestyle choices. We believe in promoting from within, and our associates enjoy unlimited opportunities for growth and advancement. TEMA is looking for a well-qualified Project Manager. This position will complete preconstruction, estimating, and project management services to assigned customers and projects across multiple markets. This team member must also manage safety, cost, schedule, customers, subcontractors, changes, and quality. Associates degree or higher education preferred. With three generations of experience, we understand the importance of hiring and retaining the best team members. Our reputation for quality and service is unmatched, and we know that our employees play a major role in that success. 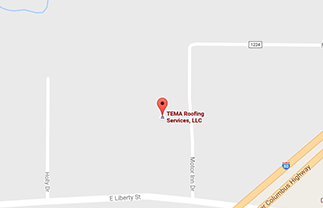 If you have questions about TEMA’s job openings, please contact us at (330) 272-0988.